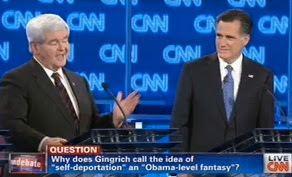 The Midnight Review: Flip Flop: Gingrich Upset About Audience Participation! Flip Flop: Gingrich Upset About Audience Participation! Republican presidential candidate Newt Gingrich was upset on Tuesday when moderator Brian Williams of NBC News asked the audience to hold applause until the commercial breaks. Gingrich even threatened to pull out of future debates if the audience was not allowed to participate. Fast forward a few days to another debate, this time Gingrich performed poorly being attacked aggressively by opponent Mitt Romney. What was Gingrich's excuse this time? Gingrich's camp claimed Mitt Romney and the Republican establishment stacked the audience with Romney supporters - an accusation that has no facts to back it up. "They definitely packed the room," Kevin Kellems, one of Gingrich's senior advisers, told The Huffington Post. "The problem for them is their candidate, at several junctures, couldn't remember what he had said before on an issue or what the fundamental truth is on a given topic. TV viewers tend to notice and remember things like that." Gingrich should amend what he said regarding the Tuesday debate. Gingrich should have said "people ought to be allowed to applaud if they want to... but only for me."